This red full-length Eclipse Sun Shade from Rugged Ridge fits 07-17 Jeep Wranglers Unlimited JK 4-door. 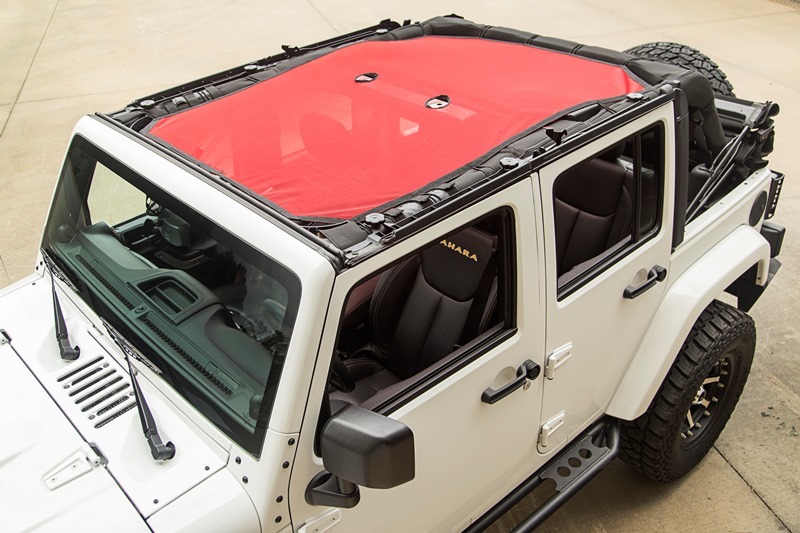 Craving that top down experience in your Jeep, but still want protection from harsh sunlight? This full-length red with black trim sunshade protects both front and rear passengers from the sun while offering a "top-down" feeling. With mesh construction, this sunshade is held between the windshield and the rear crossbar eliminating the need for a header channel. The built-in elastic straps allows this design to retain access to the Jeep's top clamps, so you can keep the shade in place and still use the factory soft or hard top.